When it comes to a local theater that was built just under a century ago, few things seem new. But in recent years, excitement surrounding the Rialto Theater’s preservation efforts has been restored. During the past few years, the Rialto’s nine-person board has been determined to restore and reopen the theater, with the help of the community. It has its own Kickstarter campaign, which has raised $18,440 so far, and at the beginning of April, Florence’s second annual Steampunk and Wine Festival raised funds to help with the restoration effort. 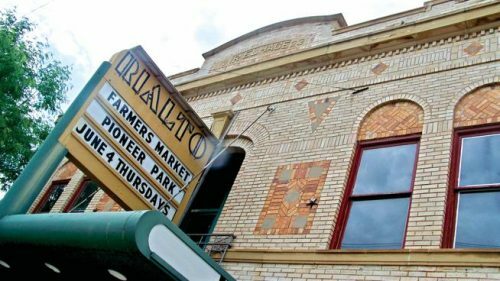 According to a list of historic theaters compiled by History Colorado, the Rialto was constructed with locally produced yellow bricks that created an unusual brickwork pattern. The theater also contains a rare 50-foot fly system that, in operation, allowed stage crews to completely hide artwork above the stage. This made it easier to switch scenes with various backdrops. Upon completion, the board’s intention is to return the theater to its original appearance, with the exception of a few code standards. Cosmetically, Williams said, the theater will look almost the same as it did when it first opened in 1923. The group was able to preserve enough of the original artwork to recreate the patterns, and in some cases, restore them. Even the handrails lining the staircases between the first and second floors are original. Project manager Larry Baker refurbished them, Williams said, but just enough to make them usable again. They still have dents in them, which were acquired throughout the theater’s long history. Since its doors first opened Sept. 25, 1923, the Rialto has served as an opera house and a theater that showed both movies and plays, with performers ranging from professionals to school-age kids. “It opened as an opera house in 1923 and kind of graduated to different kinds of entertainment throughout the years,” Williams said. The last performance took place in the 1960s, before the theater transitioned into a venue for younger performers. In the early 1980s, the Florence-Penrose School District owned the building. During that time, students utilized the stage for choir and theater performances. In the early 1990s, the theater started to deteriorate. It wasn’t until the Florence Architectural and Cultural Tradition took ownership that restoration efforts started to become a reality. After a few changes in leadership, the project began to pick up steam again and just in time. The historic 50-fly was starting to crumble and the roof was in bad shape. “It was literally getting ready to go,” Williams said, so the board stepped in and started restoration work. Shortly after that, FACT redid the foundation and put a new roof on the theater. Today, all of the infrastructure work is complete and the board is looking toward restoring the theater to its original state. A major goal right now, Williams said, is to open the theater for performances — before its official opening. “The theater won’t be finished, but we’ll be able to have performances in here and raise money easily,” he said. When it’s completed, groups — including the Fremont Civic Theater and the choir — hope to find a new home. The theater also has a music promotion adviser, who said the theater has the potential to host guests every day of the week. Additionally, Baker and his wife, Beryl, are planning to match any funds raised up to $50,000.